Our Twitter followers may remember a series of tweets about this job last year. Here's a more detailed look at the anatomy of a stone wall we built in downtown Raleigh. 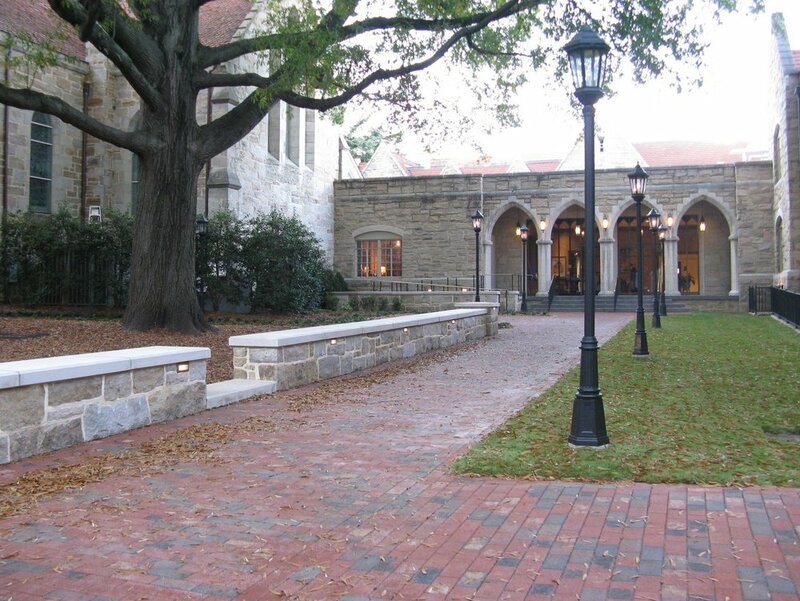 For this project, a large oak tree was key to how the stone wall was designed and constructed. 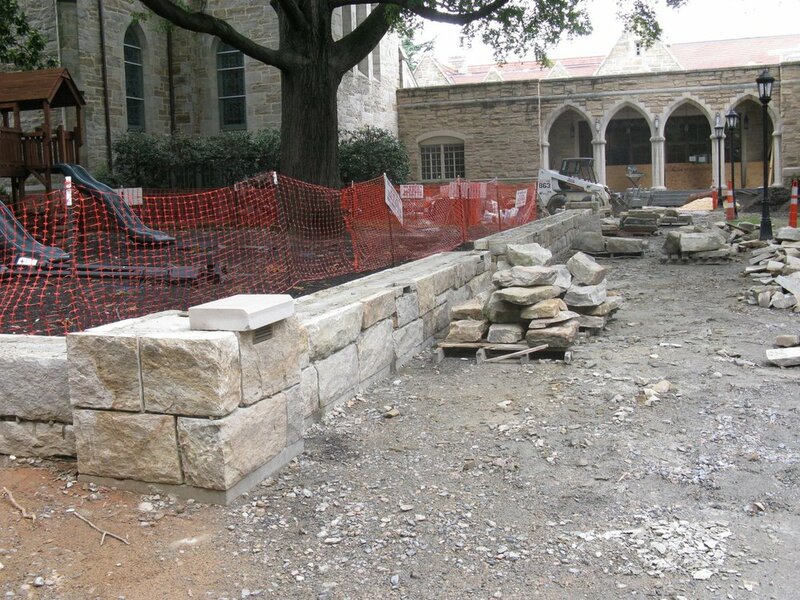 Located on the grounds of an historic church, it was important to protect the mature tree during the installation of a new sitting wall and wheelchair ramp. To minimize digging around the roots, an above-ground footing was designed. Footings can vary depending on the type of stone wall construction. Typically, it's a concrete substructure onto which the stone is layed. Sometimes, it's a trench with compacted, crushed stone, as in traditional dry wall construction. On this jobsite, the above-ground footing projects only 3” into the ground but has a side shelf for the stone to sit on. There are 3 or 4 places where the concrete footing projects 18" into the ground with a 12” thick cylinder. In Raleigh, winters are mild so the ground doesn't usually freeze below 12”. The core of the sitting wall (built by Hopco Construction of Raleigh) is 10” thick x 22” tall and reinforced with rebar. Instead of regular wall ties, vertical steel channels with adjustable wall ties can be seen. It's essentially a concrete structural beam with a stone wall built around the outside. The above-ground footing only allowed enough room for 6” thick granite. To match the stonework on the church, corner pieces were fabricated out of larger stones, giving the appearance of up to 12” thick corners. The stone wall was finished with 4” thick limestone caps. If you're not from this area, Raleigh is known as the "City of Oaks". With an innovative solution for protecting this handsome oak, it continues to remain healthy while shading a school playground. You can read more about the Christ Church project on our website.